Excerpt from Drama. 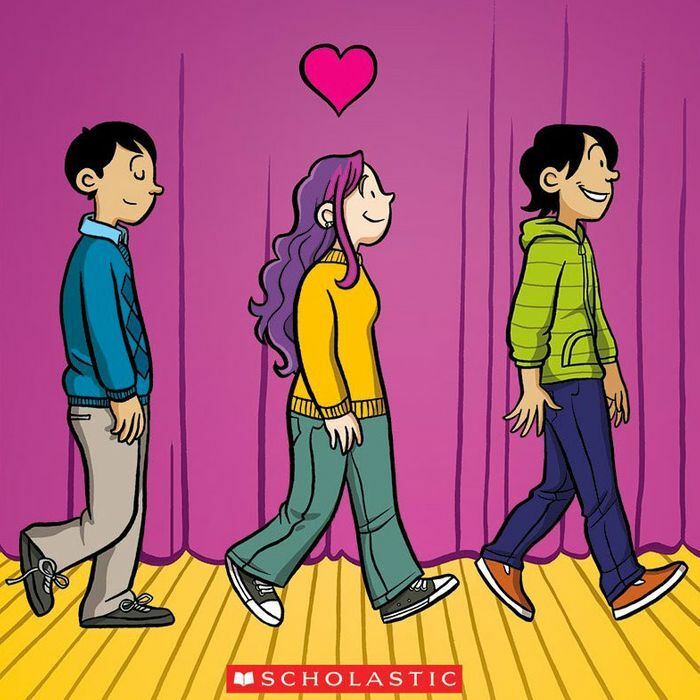 Art by Raina Telgemeier. For the vast majority of my 31 years on this Earth, I was the only comics reader in my family. I’ve been picking up funnybooks — most of them, I’m slightly ashamed to say, of the superhero variety — for decades and, with the exception of some parental dabbling in NPR-approved works like Art Spiegelman’s Maus and Alison Bechdel’s Fun Home, mine has been a solitary pursuit when it comes to my clan. So when my 10-year-old half-sister and I found ourselves in a bookstore a few months ago, I thought I’d be the cool older brother and see if I could introduce her to the world of sequential art. I grabbed a copy of Raina Telgemeier’s kid-oriented, magical-realist graphic novel Ghosts, and handed it to her. “I’ve got something cool for you to read,” I told her. She gave me that cluck of the tongue and roll of the eyes that are all too familiar to relatives of children at that age. “Ugh, I’ve already read all of Raina’s books, Abe,” she said. “All of them?” I countered, thinking she surely couldn’t have consumed every one of the eight tomes Telgemeier has written and drawn — I mean, I’d only read two of them, and I get paid to write about this stuff. But my sis proceeded to list, well, all of them. Hell, she was on track to outpace my lifelong comics habit, as I’d only started picking up comic books at age 11. There’s a new comics connoisseur in the family, and given her appetite, she’s a consumer force to be reckoned with. Indeed, there’s a whole new influx of those connoisseurs into the family of comic-book readers, and they all look like my sibling. Although the medium began as a killer app marketed to young folks in the 1930s and continued to appeal primarily to folks under 18 for a half-century afterward, comics publishers like Marvel, DC, and an array of smaller firms took a turn toward darker, more adult-oriented material in the mid-1980s. At the time, it was a wise decision: It reduced turnover by holding on to children of the Baby Boom after they might have otherwise tossed the habit aside. As of today, the average superhero comic relies on the enthusiasm of people well into their adult years, ones who enjoy — or at least tolerate — ever-more-convoluted twists on characters with whom they’re already familiar. Though they make occasional stabs at drawing new readers, Marvel and DC’s business decisions have typically been based on the desires of a veteran core. Sales to those people are decent enough to keep those companies afloat for now, but there’s usually been precious little in the way of vision for how to radically expand the market. But less than a decade ago, a tectonic shift began — and Marvel and DC had nothing to do with it. Traditional buyers like me had nothing to do with it, either. Indeed, the comics Establishment is only just now starting to play a desperate game of catch-up. That shift was the result of decisions made by librarians, teachers, kids’-book publishers, and people born after the year 2000. Abruptly, the most important sector in the world of sequential art has become graphic novels for young people. Call it the Youth-Comics Explosion. It’s redefining the future of an entire art form. Excerpt from Lumberjanes. Art by Brooke Allen and Maarta Laiho. As a result, supply is rapidly rising to meet seemingly insatiable demand. DC is hiring for a new division targeted at young readers, and has already done a bit of a stealth launch by publishing youth-friendly takes on their fabled characters like Supergirl: Being Super and DC Super Hero Girls: Finals Crisis. Marvel has built on the surprise mainstream-bookstore success of their young-adult comic Ms. Marvel by introducing more series in that vein, such as The Unstoppable Wasp and Moon Girl and Devil Dinosaur. Conventional book publishers are growing their youth-comics investments, comics publishers are doubling down on their production for youths (BOOM! Studios is relishing the ongoing success of its all-ages KaBOOM! line, for example), and kid-specific comics firms are expanding (youth-oriented publisher Papercutz just opened up an imprint for tweens called Charmz). So, what changed? As with all market shifts, the Youth-Comics Explosion can’t be pinned to any singular factor, but there are a few theories about which decisions and individuals triggered the phenomenon. Promotional art for DC Super Hero Girls. You can argue that it began with a foreign invasion. “I’d trace a lot of the beginnings of the under-18 market to the manga boom in the early aughts,” says Griepp. Virtually everyone else I spoke to concurred. Manga (the catchall term for Japanese comics) experienced a spike in American interest at the turn of the millennium, powered by the crazes for their stylistically similar cousins in Japanese animation, most notably the cartoons Pokémon and Sailor Moon. In Japan, comics have long been accepted as mainstream literature of the high and low varieties — and readers both old and young consume them. One comics creator at 2002’s YALSA became particularly influential in triggering the Youth-Comics Explosion: Jeff Smith. From 1991 to 2004, Smith had self-published a black-and-white serial comics story called Bone, which followed the kid-friendly adventures of a group of mismatched anthropomorphic bones who journey through a wild fantasy land. It had enjoyed critical acclaim and a solid degree of popularity, but had never become a massive hit in mainstream bookstores. That changed thanks to David Saylor, a longtime executive at children’s-book titan Scholastic. He’d been pondering the notion of publishing graphic novels for kids, but needed something to act as a vanguard in his mission of market change. Bone, it occurred to him, could be that vanguard. “It was longer-form storytelling, epic storytelling, great narrative, and great artwork,” Saylor recalls. Bone was finishing its long initial publishing run, and Smith was looking for something to do with it next, so Saylor proposed the idea of having Scholastic reprint the whole saga in color and use the company’s considerable market savvy to get it in front of a new audience. Smith agreed, and not only did Scholastic begin publishing the colorized Bone in 2005, Saylor even got the higher-ups to approve the creation of a whole new imprint for comics, called Graphix. That same year, established YA prose author Jennifer L. Holm and her brother Matthew Holm released a comic targeted at grade-schoolers called Babymouse, through Random House. That only came after years of rejection from other publishers. “It was a hard sell,” Holm recalls. “There hadn’t been a pure comic for kids. There were some hybrids like Captain Underpants” — an illustrated kids’ novel series begun in 1997 that featured bits of comic-book art — “but not full comics.” When Babymouse finally found a home, comics for kids were so uncommon at mainstream publishers that Random House didn’t even know how, exactly, to print a full-color comic. After what Holm refers to as some “MacGyvering,” they figured it out, and Babymouse became a smash. Excerpt from Ghosts. 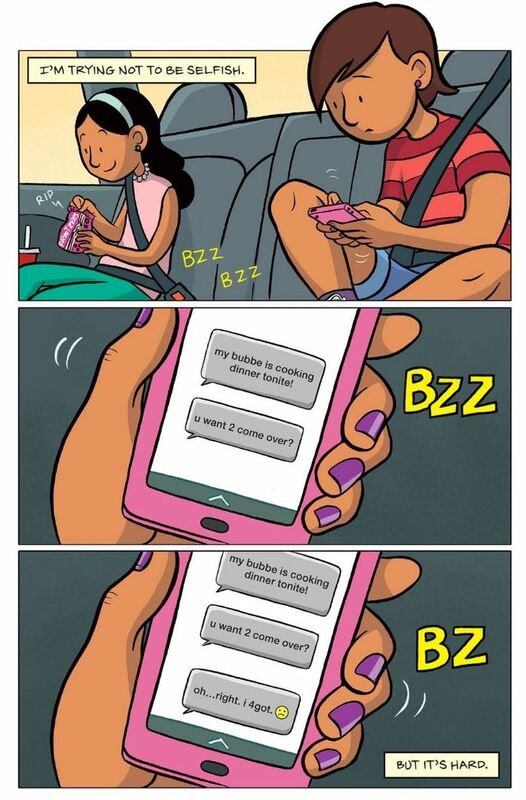 Art by Raina Telgemeier and Braden Lamb. Telgemeier continued those journal comics all the way through the end of college, building up a hefty corpus of juvenilia before meeting Joey Cavaleri, one of her teachers and an editor at DC Comics. He got her a slot for a short comic in DC’s 2005 anthology Bizarro World, and her professional career began. It was a rocky start, largely consisting of personally selling self-xeroxed mini-comics at conventions, but at the San Diego Comic-Con, she caught the attention of Saylor, who saw in her a raw and untapped talent. They met again at a festival held by New York’s Museum of Comics and Cartoon Art soon after, and he asked her to come meet with him. He needed someone to work on a Graphix initiative to make graphic-novel adaptations of The Baby-Sitters Club, and asked her to take it on. Nervous, she accepted the task. “She ended up being this perfect storm of talent and energy and content that just really worked,” Saylor says of Telgemeier’s Baby-Sitters Club work. Filled with deliciously thick lines and vivid facial expressions, the books raised her profile and the material flew off the shelves, but they were, at the end of the day, adaptations, not a pure expression of Telgemeier’s vision. That only came in 2010 with the release of her first masterwork, Smile. Thanks to the deep market penetration of Scholastic’s book fairs, Smile became an insane hit, unlike anything that preceded it in the modern youth-comics market, going on to spend more than 200 weeks on the Times’ comics best-seller list. After it came 2012’s Drama, 2014’s Smile sequel Sisters, and last year’s Ghosts — all of them sensations. Though the quality of the books and Scholastic’s wise distribution efforts were key, so too was Telgemeier’s personality and willingness to tour. On her nationwide jaunts, she started to see the human impact of her work. “I was seeing how many kids were coming to my events with these amazing dog-eared, falling-apart, taped-together copies of my books,” she says. Even when they couldn’t meet her in person, they showed their enthusiasm. “Kids were sending me drawings and they were quoting my scenes and there were YouTube videos re-creating my stories,” she says, sounding awestruck. 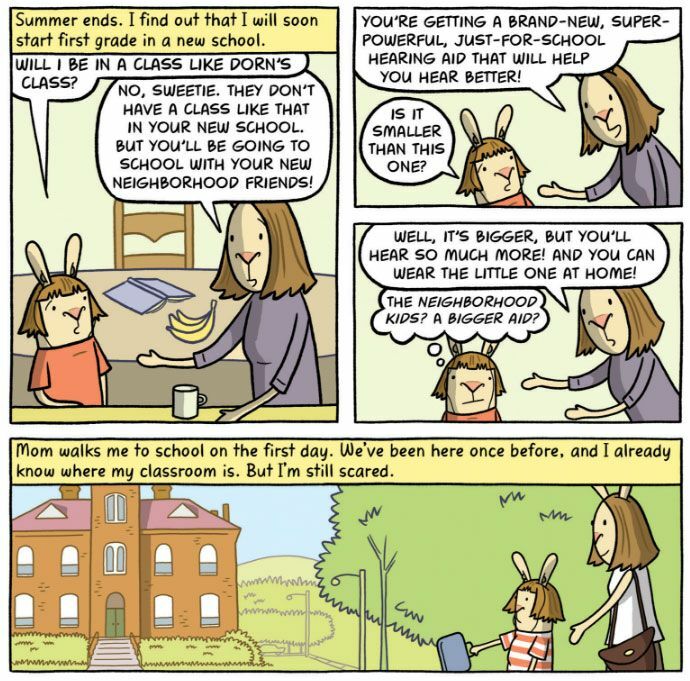 Telgemeier’s brand of slice-of-life comics for grade-schoolers opened the door for an array of creators with similar instincts, such as Cece Bell, whose hit 2014 graphic novel El Deafo depicts her childhood struggle with hearing loss; or Svetlana Chmakova, whose manga-influenced Awkward and Brave chronicle attraction and rivalry within diverse student communities. But the Youth-Comics Explosion has also brought a cornucopia of other options for young people of various ages. Want an elegant account of queer teen romance (created by an actual teen, no less)? Try the works of Tillie Walden. Looking for sci-fi action with a strong female lead? Check out Scott Westerfeld and Alex Puvilland’s Spill Zone. Interested in team adventure with a fantasy twist? 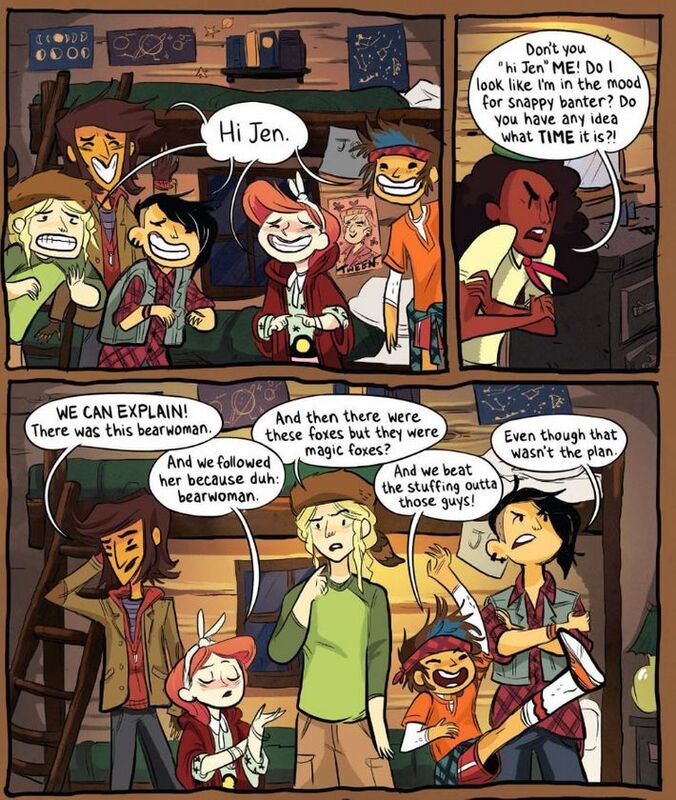 Grab BOOM!’s massively successful ongoing series Lumberjanes. Want some humor mixed with horror? Pick up Mariah Huehner and Aaron Alexovich’s Stitched, published by Papercutz. Interested in a solid take on a classic? IDW Publishing’s My Little Pony: Friendship Is Magic and Teenage Mutant Ninja Turtles titles are aces. The list goes on and on. Excerpt from El Deafo. Art by Cece Bell and David Lasky. One of the most remarkable things about the Youth-Comics Explosion is how much it reaches out to young girls — a population long alienated by mainstream superhero comics. That’s due in no small part to another remarkable thing: A massive portion of the people creating these comics are women, something unheard of in the majority-male space of superhero-comics publishing. “There tends to be an attitude at some of the major publishers that it’s impossible to find women to work on books, and that’s not true,” says Huehner, who also edits Charmz. “If you’re gonna tell stories for young women and girls, I think having a creator who has experienced that matters a lot.” Hibbs has set up a graphic-novel-of-the-month club for kids at his store, and has noticed that there’s about a 70/30 percentage breakdown of girls and boys among his kids’-comics buyership. Those kinds of numbers represent a drastic shift from the comic-shop buying demographics of even just a decade ago, and will change the future of the medium. Indeed, for the first time in a long time, it seems like there is a long-term future for comics. No wonder Marvel and DC are trying to get in on the action: Those who think about what youths want in their sequential art have the opportunity to plan for holding on to comics readers who will still be alive 70-odd years from now. Holm has seen those generational effects already. “Now it’s funny if I go to an event, because some college girls will say they grew up reading Babymouse, and it’s like, God, I’m really old now,” she says with a laugh. Perhaps Lumberjanes co-creator and BOOM! editor Shannon Watters best sums up the promise of this vibrant moment. “For kids, the media that they consume, but especially books — especially books — are extremely personal,” she says. “So when you’re making these books that just speak to them in this very profound way, it’s really, really special. It makes everything worth it when you have kids coming up to you and telling you that your books changed their lives.” And not only their lives, but the life of an entire medium. I’d better start asking my sister for more book recommendations.